Wonderful news: Frontier Natural Products Co-op has offered Rural Action a $10,000 challenge grant to raise money for the Native Plant Rescue. That means that for every dollar you contribute to the Native Plant Rescue, Frontier will give Rural Action an additional dollar. Participants in the Native Plant Rescue will dig up native forest plants from the future site of the State Highway 33 bypass through Wayne National Forest. The plants will be placed in holding and seed production beds for future restoration projects as well as native plant beds for public enjoyment and education. Contributing to this effort is your chance to protect a piece of our forest heritage! Learn more about the plant rescue by clicking here. 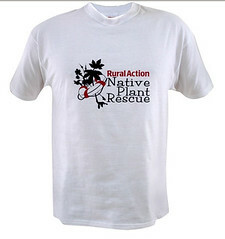 Native Plant Rescue T-Shirts For Sale! These stylish organic cotton tees are available in all sizes for $20 each. T-shirt purchases count toward the Frontier challenge grant. To order, call 740-767-4938. Two Rural Action watershed groups have been awarded grants to continue cleaning up streams in Southeast Ohio. Monday Creek Restoration Project and the Federal Valley Watershed Group were two of just 19 watershed groups from across the state selected to receive the grant. The grant, worth $105,000 to each of the groups over the next three years, will pay the coordinators to continue clean-up and education efforts in their watersheds. “These grants are valuable investments in grassroots efforts to ensure clean, plentiful water throughout Ohio,” said Governor Bob Taft in a release. Congratulations to Mike Steinmaus of Monday Creek and Lisa King of Federal Valley! 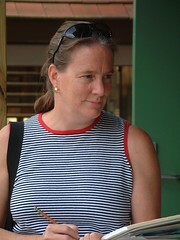 Amy Jordan Webb, an expert in heritage tourism from the National Trust for Historic Preservation, is touring Southeast Ohio this week. She’s looking with an expert tourist’s eye at places of interest in our region – like the Crooksville Ceramic Pottery Museum and the historic village of Shawnee – that could be part of a major network of heritage tourist sites. Heritage tourism helps people gain an appreciation of the past and of their culture by visiting historical places like old buildings, industrial centers, battlegrounds or other sites. Webb is working with Mary Steinmaus of Rural Action, artists, nonprofit workers, tourism officials and small business owners to start formulating a plan to expand heritage tourism opportunities in our region. 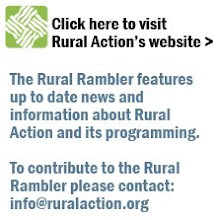 The Rural Rambler caught up with Webb during the second day of her tour to ask a few questions. Read the interview by clicking here.